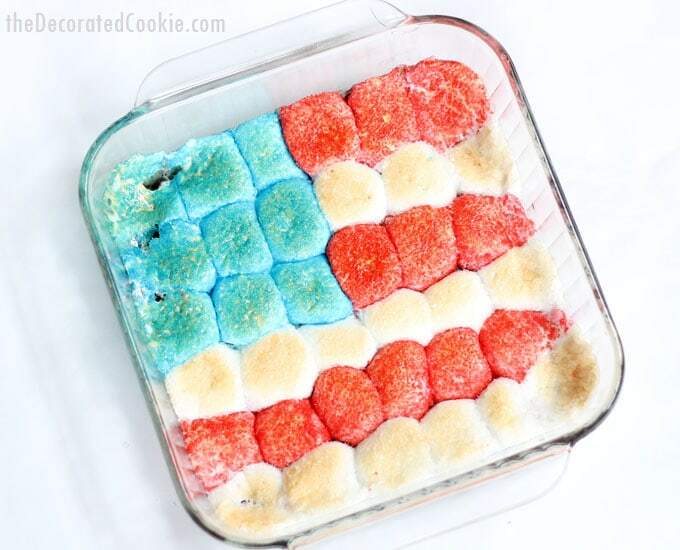 flag s'mores dip for 4th of July desserts. Video recipe. 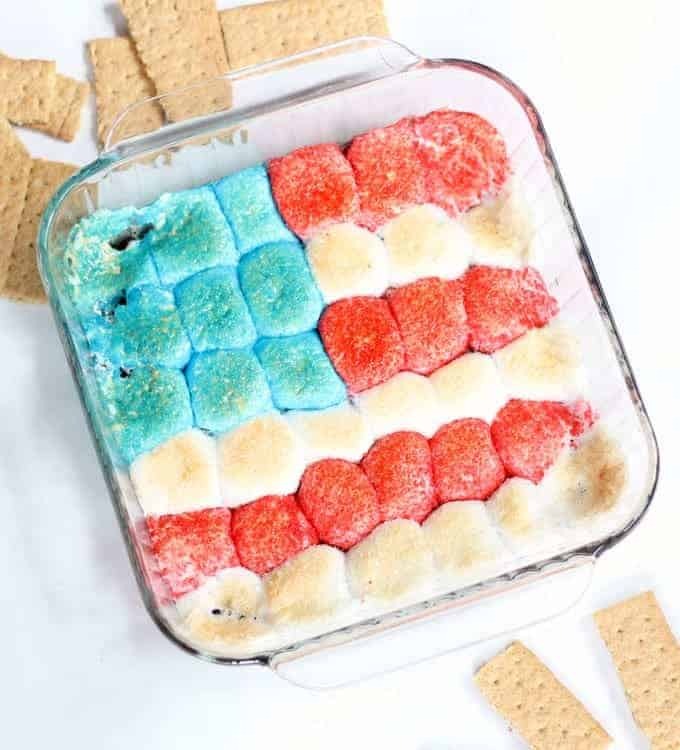 The ORIGINAL American flag s’mores dip dessert is a super-easy 4th of July dessert to celebrate Independence Day. As Memorial Day and Independence Day quickly creep up on us, I thought I’d pull out some red, white, and blue sprinkles. 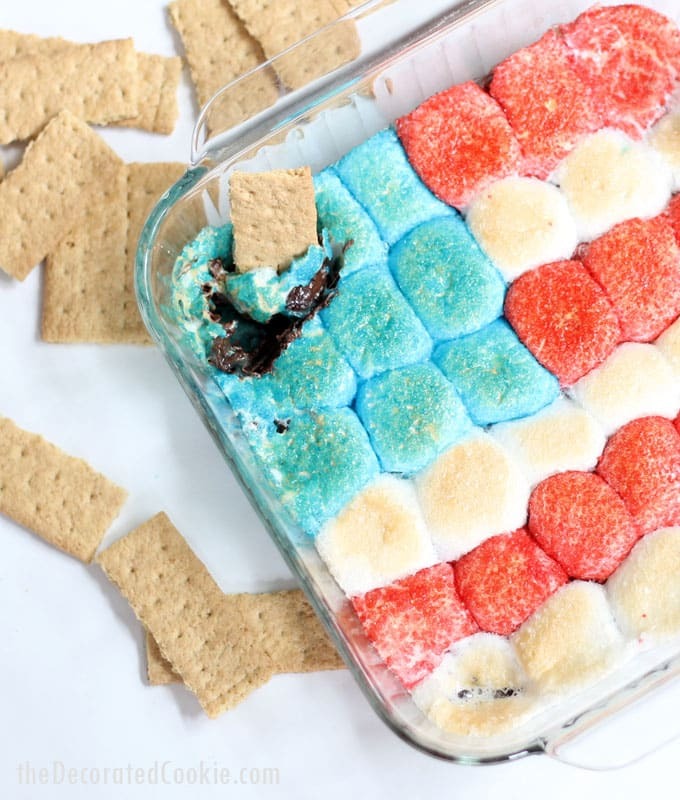 This flag s’mores dip is one of the easiest 4th of July desserts you can make, but it’s such a party conversation starter. Marshmallows, sprinkles, and chocolate. What’s not to love? It’s been a weird year in America. I wasn’t sure how I’d feel going in to these holidays of patriotism. But for all the weirdness of the past year, it has, I believe, possibly heightened patriotism, activism, involvement, and overall political awareness. And that is reason to celebrate. 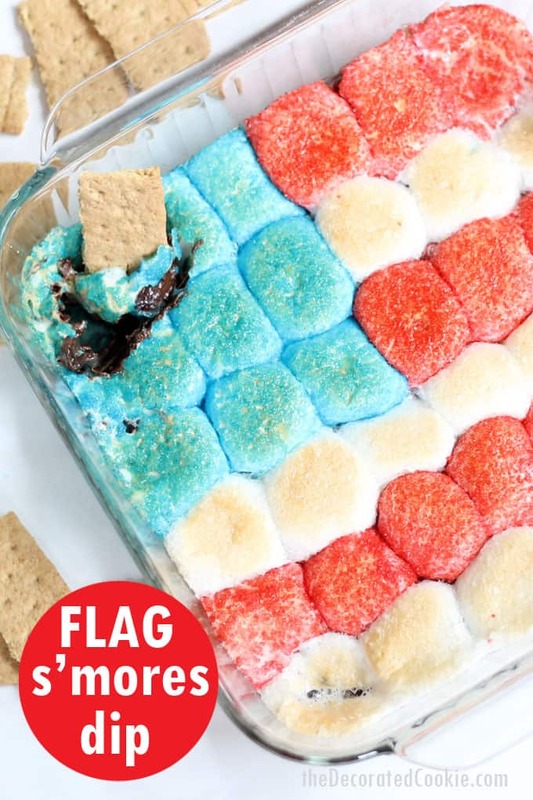 You know, and flag s’mores dip captures all that (sidelong glance). 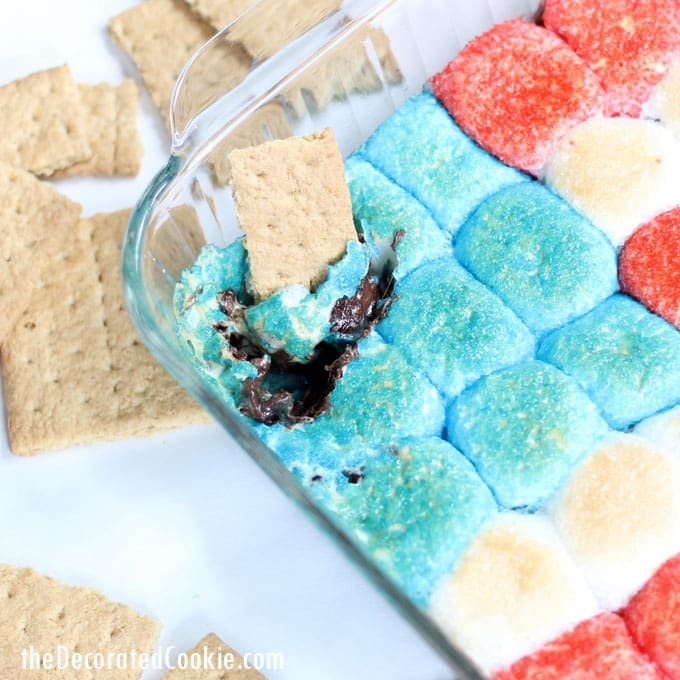 This American flag s’mores dip is modeled pretty exactly on my rainbow s’mores dip. 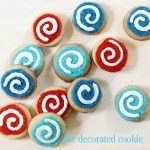 Since I loved that one so much (for it’s deliciousness, cleverness, and ease-of-making), I decided a flag version would make the most perfect Summer, Memorial Day, and 4th of July dessert ever. To echo how I described the rainbow s’mores dip, the beauty of this method is that the sprinkles form a perfect crystallized topping to the dip so you get the most divine combination of chocolate, creamy marshmallow, and sweet crunch. 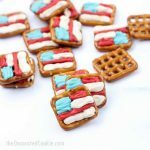 Need more easy, patriotic treats? 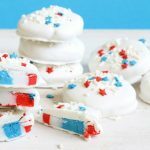 Try these patriotic pretzel bites, crazy 4th of July candy pops or red, white, and blue marshmallow kabobs. 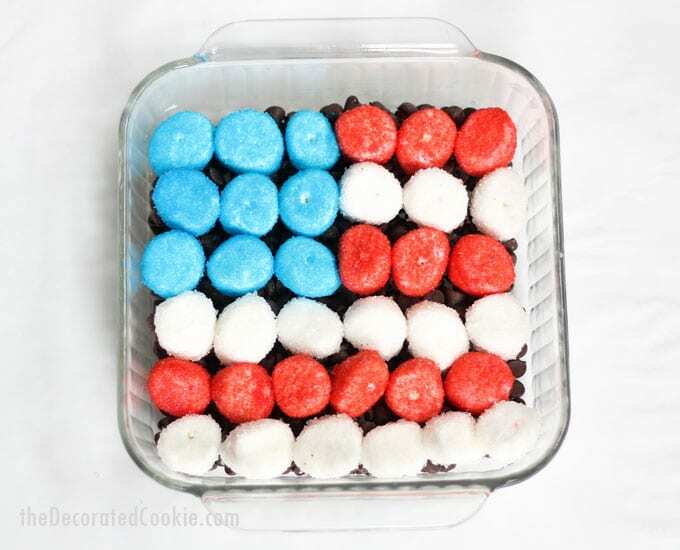 Or if flags are your thing, then try these American flag cookies. *Find sprinkles in the craft store. Here, I used Wilton sparkling sugars in red, white, and blue. First, prepare the marshmallows. Have ready a baking tray lined with wax paper, marshmallows, toothpicks, a paper towel, and the sprinkles. Skewer a marshmallow with a toothpick, submerge it totally in water quickly, dab on the paper towel, hold over a bowl and cover completely with blue sprinkles (both the top and bottom, too). Prepare five blue marshmallows. (If any part of the tops are missing sprinkles, just add some with your fingers.) Repeat with the white and red sprinkles, making eight white and seven red. Let dry at least twenty minutes. Grease some kitchen scissors with butter or Crisco and cut each marshmallow in half, wiping the blades clean between colors. Next, prepare the s’mores. Grease the baking dish with butter or Crisco. Pour the chocolate chips evenly in the dish. Top with the marshmallows, cut-side down. Arrange 9 blue halves in the top corner. 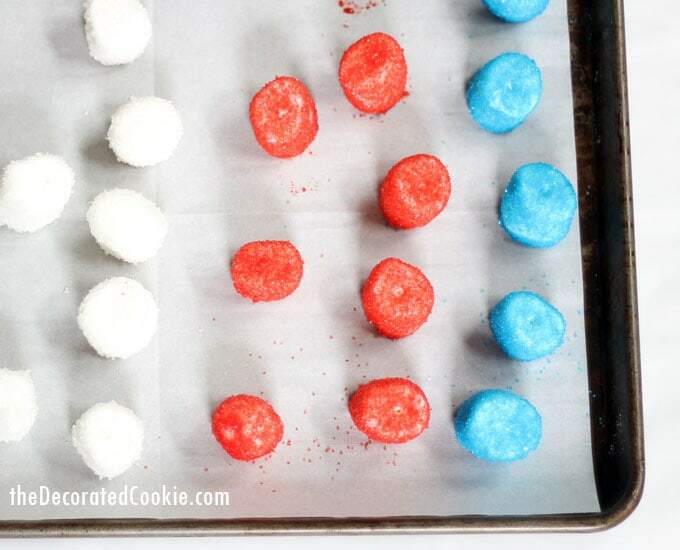 Arrange stripes of red and white, 3 red marshmallow halves, 3 white, 3 red, 6 white, 6 red, and 6 white. You should have a couple halves leftover. Bake in the oven for 7 to 9 minutes, just until the tops of the marshmallows start to brown. Serve with graham crackers and/or pretzels and enjoy!! Best served warm. First, prepare the marshmallows. Have ready a baking tray lined with wax paper, marshmallows, toothpicks, a paper towel, and the sprinkles. Skewer a marshmallow with a toothpick, submerge it totally in water quickly, dab on the paper towel, hold over a bowl and cover completely with blue sprinkles (both the top and bottom, too). Prepare five blue marshmallows. (If any part of the tops are missing sprinkles, just add some with your fingers.) Repeat with the white and red sprinkles, making eight white and seven red. Let dry at least twenty minutes. Grease some kitchen scissors with butter or Crisco and cut each marshmallow in half, wiping the blades clean between colors. Next, prepare the s'mores. Grease the baking dish with butter or Crisco. Pour the chocolate chips evenly in the dish. Top with the marshmallows, cut-side down. Arrange 9 blue halves in the top corner. 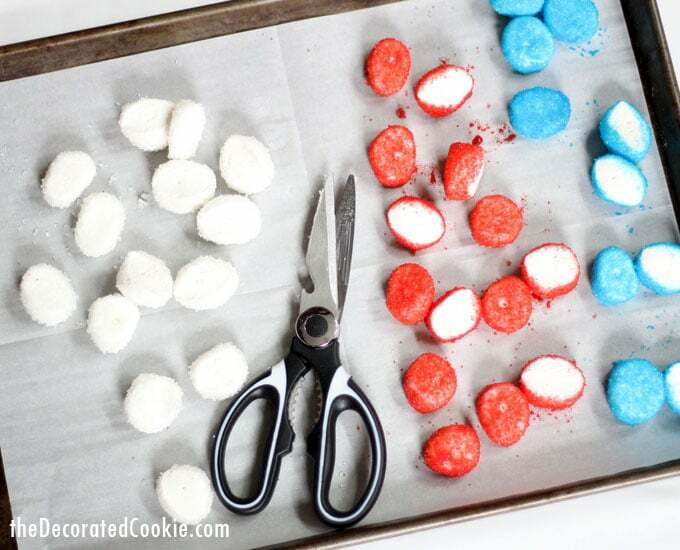 Arrange stripes of red and white, 3 red marshmallow halves, 3 white, 3 red, 6 white, 6 red, and 6 white. You should have a couple halves leftover. Have you ever tried to do the s’mores recipe with a graham cracker crust and them cut it to serve! Can this be made in advance and sit before baking ? Hi Amanda, yes! Absolutely. The sprinkles form a bit of a coating on the marshmallows to keep them fresh, but I’d maybe put some plastic wrap on top anyway. Then, remove the wrap before baking. I would not let it sit too long after baking, but prepping hours in advance is totally fine! Hi! Are there a specific type of sprinkle to use? Thanks! Great question Meryn! Any will work, really, and any size depending on the look you’re going for, but here I use more of a “sanding sugar” (so pretty thin) sprinkle. Specifically, I used the Wilton brand, found at Michaels craft store. They are labeled as “sprinkles,” but under the name sprinkles they say “red sugar” (or blue or white). This was really easy and fun to make! My family loved it! I’m so glad Darby!! 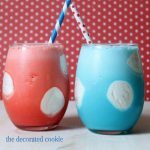 Now that the 4th of July is over, you can also make a rainbow version!